The UNESCO World Heritage sites of Ellora and Ajanta are among the finest historical attractions in India. These archeological sites are home to cave temples dating back to the period between the 4th and 9th centuries. These temples are the most famous examples of cave temples in India. 29 km from the city of Aurangabad in Maharashtra, Ellora boasts 34 rock-sculpted temples dating back to sometime between the 5th and 8th centuries. These cave temples belonging to the Hindu, Buddhist and Jaina faiths have been chiseled out of the hills. There are 12 Buddhist cave-temples. The largest of the Buddhist group is Cave 5, Out of these cave temples, created between the 6th and 8th centuries, the "cave of the celestial carpenter, Vishwakarma" (Cave 10), also known as Sutar ka jhopda "carpenter's hut", is considered to be most beautiful. 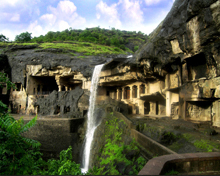 The number of Hindu caves in Ellora is 17 (caves 13–29). Of these the awe inspiring Kailashnath Temple (Cave 16) carved out of the single solid rock hewn out of Charanandri hills, is the zenith of rock-cut temple architecture in India. 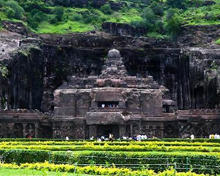 This most famous attraction of Ellora is widely considered by the historians and experts India's finest work of art. This colossal structure, dedicated to Lord Shiva, was built by the Rashtrakuta ruler Krishna I (756-775 AD). The Rashtrakutas ruled in Deccan for more than two centuries. 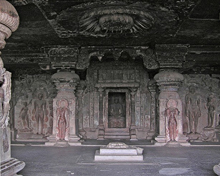 The carvings of the Kailashnath Temple are among the finest sculptures in India. Of the five Jaina caves (caves 29-34), Cave 30, also known as Chhota Kailasa, is the largest and houses the figures of Jain saints. Indra Sabha (Cave 32) is the finest of the Jain caves. 106 km northeast of Aurangabad, the jaw dropping twenty nine cave temples of Ajanta date to a period from the 2nd century BC to 7th century AD. These rock-cut Buddhist monasteries were excavated in the horseshoe curve of a hillside set in the valley of the Waghora River. The wonderful sculpture and beautiful paintings with which they are adorned make them one of the most magnificent monuments of ancient India. For about a millennium, Ajanta caves remained in forest cover, till it was re-discovered by the British officer John Smith in 1819. A drive from Aurangabad to Ajanta usually takes two and half hours. It is in the essential fitness of things that you set off early in the day to avoid as much of the midday heat as possible. Most people prefer to stay in Aurangabad which is 29 km away and offers a wide array of accommodation options to choose from to suit all budgets. Ranging from luxurious hotels to budget hotels and rest hostels, these hotels are a perfect base from which to explore the beautiful site of Ellora. However, if you are willing to stay in Ellora then Hotel Kalidas, Etranger reports and Hiranya resorts are located within a radius of 10 km. How to Reach Ajanta and Ellora by Air: Airport at Aurangabad is the nearest airport and is 29 km and 106 km away from Ellora and Ajanta respectively. How to Reach Ajanta and Ellora By Rail: Nearest railhead to Ajanta is Jalgaon railway station which is 59 km from Ajanta. Jalgaon railway station is connected with all major cities of India. How to Reach Ajanta and Ellora by Road: Ajanta and Ellora are easily approachable by regular buses, taxis, coaches and tourist cabs from different parts of Maharashtra.